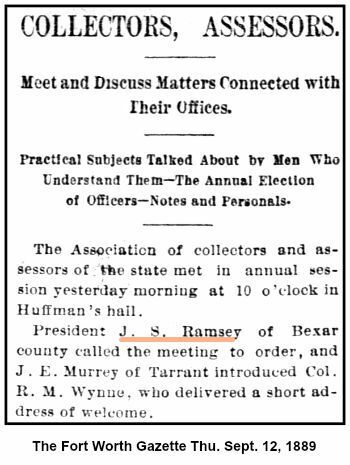 Grand Master John J See resigned his office in April 1889 and moved to Taeoma Washington thus relinquishing the reins of government to Deputy Grand Master J.S. 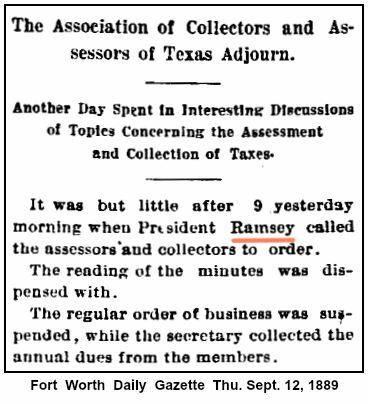 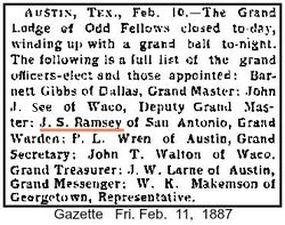 Ramsay who at once began the duties devolving upon him by virtue of such resignation He submitted his report to the Grand Lodge at the fiftieth annual session in the city of Dallas February 3 1890 handed the gavel to his successor in office Grand Master Dr TW Wiley of McKinney and became a Past Grand Master of the Grand Lodge of Texas It appears that the tide turned in 1889 and Texas Odd Fellowship which had been going downward for several years had begun to make some progress in the opposite direction A net gain of about six hundred members was reported in 1890 tabulated of course from the December returns for 1889 The fact is the net gain was not more than two hundred since four hundred members were added for non reporting lodges something that was not done in the tabulations of 1889 However it was very evident that progress and prosperity were on hand two things with which Texas Odd Fellowship had not been very familiar for practically a period of ten years Notwithstanding the good report above referred to only two lodges Goldthwaite No 330 and Metropolis No 331 another Dallas lodge were instituted under the administration of Grand Master Ramsay It was worthy of mention however that the defunct lodges at Abilene Huntsville Pleasanton Colorado City Stephenville Overton and Brecken ridge had been resuscitated WP Sebastian at the present time. 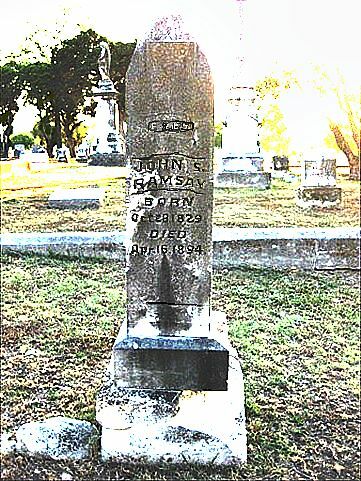 May 31 1889 occurred the disaster of Johnstown Pennsylvania when the dam of a large reservoir some miles above the little city gave way and a column of water many feet in height went roaring and rushing down the beautiful valley of the Cone maugh carrying death and destruction to every one and to everything in its pathway Johnstown since it was situated so as to receive the full force and effect of the maddening waters was almost swept from the face of the earth Odd Fellowship in Johnstown to say nothing of the destruction of property was sorely affected since the reports gave the death of Odd Fellows 32 wives and widows of Odd Fellows 35 and children of Odd Fellows 97 The Odd Fellows of Allegheny county Pennsylvania immediately organized a relief association and hurried to the scene of distress Grand Sire Underwood sent a message to Past Grand Sire James B Nicholson requesting him to repair at once to Johnstown and take charge of the distribution of funds contributed by Odd Fellowship for the relief of the sufferers Grand Sire Underwood also issued a call for relief to the several grand jurisdictions and in less than thirty days American Odd Fellowship donated for the benefit of Johnstown the mgnificent sum of $62,646.69 Under a call for the above purpose issued by Grand Master J.S. 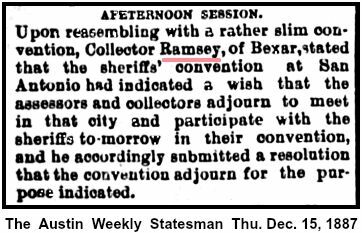 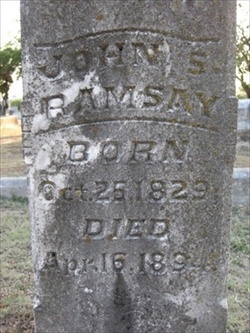 Ramsay June 12 1889 Texas Odd Fellowship notwithstanding her reverses and depressions responded in a most liberal manner and thus helped lay another stone on its grand 'Monument of Charity'. 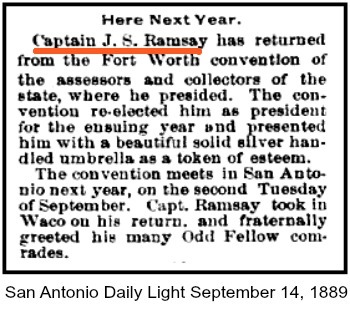 Before the adjournment of the fifty fifth annual session of the Grand Lodge of Texas a tribute of respect was paid to the memory of Past Grand Master John S. Ramsay who died at his home in San Antonio Texas April 16 1894.